I thought in preparation for the Kristine ID Wallet Sew Along I would share with you where I get my hardware and zippers. Unfortunately, I didn’t think of doing this until now – two days before the start of the Kristine ID Wallet Sew Along. You should still have time to order supplies (from my suggested suppliers or from other sources) in time to finish your Kristine ID Wallet before the random drawing for prizes which will be held on Monday, October 16th. There are very few items you need, so you may have what you need on hand. I get magnetic snaps, ½” swivel snap hooks and ½” D-rings (if I am not using a split key ring) for the Kristine ID Wallet from Emmaline Bags. Make sure to check out the many choices of finishes - antique brass, copper, gold, gunmetal and of course nickel. Emmaline Bags is my main source for bag hardware, whether for the Kristine ID Wallet or for other bags. Emmaline Bags is located in Canada and Janelle, owner of Emmaline Bags, has excellent customer service and high quality bag hardware. I have two sources for split key rings, Purple Mountain on Etsy and Shapenty on Amazon. 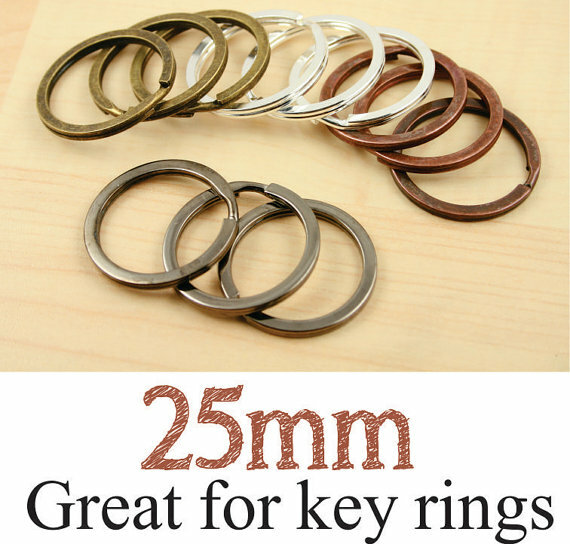 Both suppliers sell key rings that are 1" (25mm) in diameter. Purple Mountain also sells key rings that are about 1 1/4" (30mm) in diameter. I ordered the 1" (25mm) key rings from Purple Mountain, but now I realize that they are larger, so I think they sent me the extra large (30mm) size. Both suppliers have shiny nickel key rings, but I will have to say if you look closely you will see small scratches on the key rings from both Purple Mountain and Shapenty. I have ordered key rings from several sources and these are the best two that I have found. Overall, the key rings look pretty, so I am still recommending these two suppliers. If you are looking for something other than nickel, Purple mountain also has bronze, gunmetal and antique copper and Shapenty also has black. When I ordered the nickel key rings from Purple Mountain, I also ordered a few in antique copper and bronze - they are really nice! If you would like to use a regular snap instead of a magnetic snap, I highly recommend Snap Source. They have a huge variety of colors in size 16 snaps – the size I use for the Kristine ID Wallet. Snap Source also has a tool for installing snaps, The SnapSetter tool, that is easy to use and reasonably priced. Make sure you buy the correct tool for the snap size you are purchasing. I like to buy my snaps in a variety of colors, so I usually purchase from their color collections which offer 20 sets of snaps in four pre-determined colors. You can also buy snaps multi-colored packs are always what I order usually, but you can also choose choose to buy 10 sets or 50 sets in a single color in their cap sets section. They have pearl snaps and different sizes of snaps too! I get my zippers from Zipit. They have YKK zippers in a large variety of colors and lengths. I use #3 nylon coil zippers for the Kristine ID Wallet. Zipit sells zippers that are 5” long, a perfect size to purchase for the Kristine ID Wallet! I love choosing a variety of colors when I order! I have written an entire blog post on what gauge of vinyl to use and where to purchase it. You can read all about clear vinyl in the Some Information About Clear Vinyl blog post. Don’t forget to check for things that you may have around that you could take a small piece of vinyl from – things like the plastic, zippered bags that bedding sometimes comes in. One more unnecessary, but oh-so-pretty addition to the Kristine ID Wallet - bag bling! I have found that the zipper pulls from Andrie Adornments work so well with the Kristine ID Wallet. They are high quality and come in different colors and with different quotes. If you don’t want to add a zipper pull, but want a little bling on your Kristine ID Wallet, the zipper pulls work well as charms on the key ring or on the D-ring! Of course, you will need the Kristine ID Wallet pattern for the sew along. You can purchase it at a 20% discount now through Monday, October 16th! Purchase the Kristine ID Wallet pattern from the Uniquely Michelle Website Shop, the Uniquely Michelle Etsy Shop, or the Uniquely Michelle Craftsy Pattern Shop. Use the discount code”SEWKIDW” if you are purchasing from the website or Etsy. The price is already reduced on Craftsy.